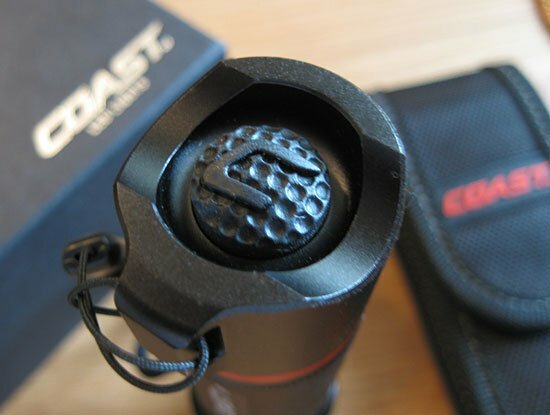 Coast Products designs and markets reasonably priced LED flashlights, multi-tools, and pocketknives. I am testing their new HP7 model that has some features I really like in a handheld search light. 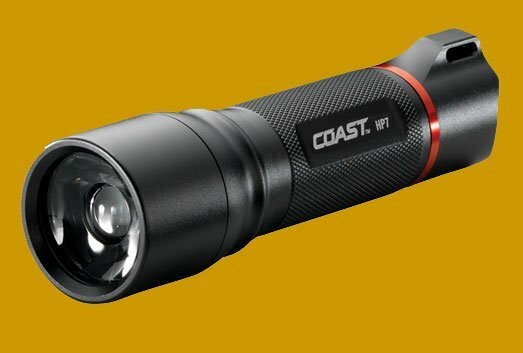 The HP7 is an LED flashlight with an anodized aluminum barrel, rubber rear switch, and a spot to flood focusing head. The light is larger than most handhelds, measuring 5.54” in length, 1.24” in body diameter, and 1.49” in head diameter. The light weighs a solid 7.2 ounces, with batteries. Light output is 251 lumens on high and 58 lumens on low. The HP7 uses 4 X AAA batteries for run times of 5 hours 45 minutes on high and 10 hours on low. It is water resistant to 1 meter for 30 minutes and impact resistant. Coast’s HP7 has what they call a “pure beam focusing optic system with fingertip speed focus control.” I found this means the head of the light easily slides forward and back for beam focus. Turning the head clockwise locks the head in any setting. The spot focus has a very distinct strong center beam and a smaller peripheral throw. Opening up the focus to flood produces a shadow-free circle of light that is very large in diameter. This is where this light excels. I like the clean bright illumination the HP7 sends in this mode. The rear of the aluminum barrel has a raised slot for a lanyard, which is provided. The tail cap is protected by the sides of the barrel and has a meaty, textured rubber button. The design allows for the light to be placed in a standing position with the beam shining upward. A momentary function is built into the rear button, which also cycles between high and low with a soft touch and clicks into either mode with a firmer push. I found the button to be very intuitive and easy to master. Included in the box with the light and lanyard is a flapped nylon sheath, which can be fitted to a belt or MOLLE webbing. 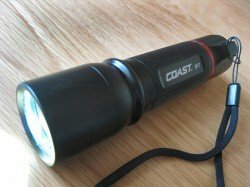 I like the fact this flashlight uses conventional AAA batteries, as opposed to other costlier and more difficult to find ones (you know what I mean). The HP7 and sheath are sturdy and well made. I find the flood beam very good for search work because it evenly illuminates a large area, without the “Blair Witch Project” constant movement of a narrower focus. The HP7’s 251 lumens are more than adequate for general use and about a hundred lumens more than most commonly used LED lights. One thing I will say about my test model is that the locking function worked well in all but the spot focus. When I locked the light in the spot, the beam opened a bit from its tightest pattern, though this was a minor concern. 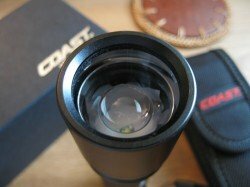 A sweep of the Internet found the Coast Product’s HP7 for sale at several retailers for less than fifty bucks. Niceshh! Randall is a twenty-four year sworn police officer in a mid-sized Florida police department. He likes things that light up the darkness.